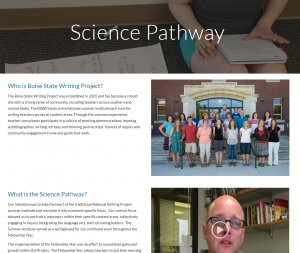 Summary: Created as part of the Building New Pathways to Leadership initiative, this website documents the Boise State Writing Project’s year-long Science Pathway, designed to cultivate science teacher leaders in the site and state. Site leaders interested in expanding their site’s content-area specific offerings, can see each step of the Summer Institute and following Fellowship Year, including guidelines for and examples of the variety of writing teachers produced, and an exploration of what was kept from the traditional Writing Project Summer Institute, and what was incorporated to make the program discipline-specific. Our intention was to take the heart of the traditional National Writing Project summer institute and translate it into a content-specific focus. Our science focus allowed us to work with educators within their specific content areas, collectively engaging in inquiry, integrating the language arts, and cultivating leaders. The Summer Institute served as a springboard for our continued work throughout the Fellowship Year. The implementation of the Fellowship Year was an effort to consolidate gains and growth within the Project. The Fellowship Year allows teachers to put their learning from the ISI into practice in their classroom contexts. A requirement of the Fellowship Year is to reframe an existing unit around the principles of inquiry and citizen science, tenets of the ISI. Throughout the year, teachers receive feedback and continual support as they implement strategies gained from the ISI.